This wonderful recipe (and the brussels sprout leaves) comes from my mother-in-law. She creates and prints out recipes for her farm customers, who sometimes need some creative encouragement to induce them to purchase some of the “exotic” produce that she offers at the organic farm that she and her hubby, Larry own and farm. All four of us liked these. I knew that we had a heavy dinner coming, so these fit the bill perfectly – a great, light lunch. I would be tempted to put some of the leftovers into Boy and Girl’s lunch tomorrow, but I’m afraid their schoolmates would think that they are too “weird”. Conformity is a big thing at their age. It makes it really hard to inspire your kids to eat well at school when their buddies are eating Doritos and individual serving-sized bags of Kraft marshmallows. Can you honestly believe that they even MAKE such a thing? I just don’t get it – why not just pack your kid a baggie filled with sugar? It’s a long story, but I initially browned too much beef and didn’t make enough rice, so I had to make more and consequently ended up with more filling than I needed. 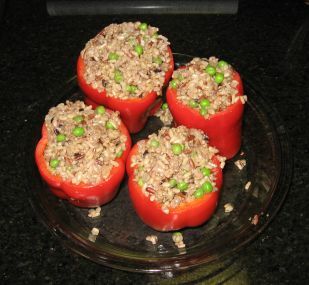 I had some red bell peppers and decided to stuff the remaining filling in them. Into the freezer with them, to have another day………. Set a large (stockpot) pot of water on to boil. Cook rice in beef stock, adding frozen peas and and about 1/2 cup more beef stock (than is required to cook the rice) during the last few minutes of cooking time. In a large saute pan, brown the garlic, onion and ground beef together. Drain. Gently place brussels sprout leaves in pot of boiling water and simmer about 4 minutes. Remove with tongs or a spider strainer and set aside. 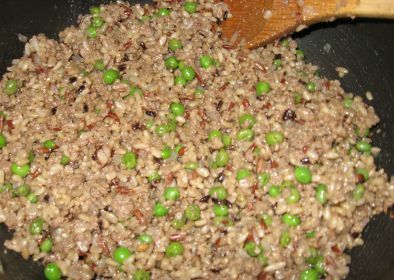 Mix cooked rice/peas together with beef mixture and add all remaining ingredients (herbs). 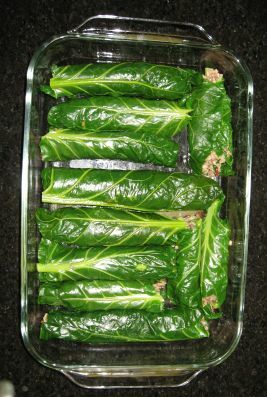 Place about 1/4 cup of filling mixture in each leaf and roll up, gently but tightly. Place on a serving platter and dig in. Depending upon your mood, these can be finger food or “fork food”. We used forks today. You likely already thought about this, but you can use the Brussels greens instead of tortillas for enchiladas, wilting them first. Thanks for the post, Im going to make these tonight. Have some growing in the garden.